The PRO42 is a wide-range miniature condenser microphone with a hemi-cardioid (half-space cardioid) polar pattern. It was designed for surface-mounted applications in high-quality sound reinforcement and other demanding sound pickup situations. Its small size makes the PRO42 ideal for use in applications where minimum visibility is required. The PRO42 features a 25′ (7.6 m) permanently-attached miniature cable with an XLRM-type connector, which allows it to be plugged directly into an XLRF-type jack or cable connector. The unit’s integral electronics can be powered from any external 9V to 52VDC phantom power source. With the fixed-charge “back plate” construction, a gold-vaporized diaphragm just 2 microns thick (about 0.000079″) can be used. This reduces moving mass substantially, improving frequency response and transient response while reducing distortion. Positioning a properly designed miniature unidirectional microphone centrally on a large, flat, unobstructed surface yields several distinct advantages. Directionality is increased by 3 dB, promoting enhanced gain before feedback and further suppression of ambient noise. Sensitivity is increased for improved signal-to-noise ratio. Phase distortion due to reflected sound energy from the boundary itself is eliminated. The microphone element is enclosed in a rugged case and protected by heavy perforated steel. 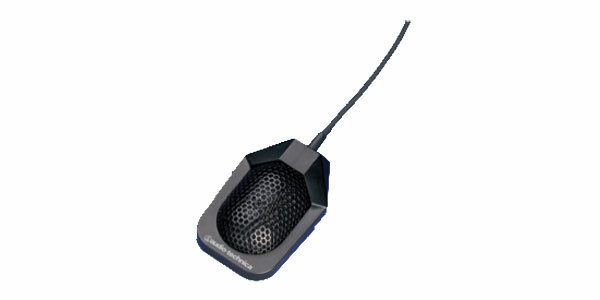 The rubber non-slip bottom pad minimizes mechanical coupling of surface vibrations to the microphone. The low-profile housing has a low-reflectance black finish.